Four civilian employees in the Exhibit and Property department put on administrative leave. Blais, speaking to reporters earlier this year. 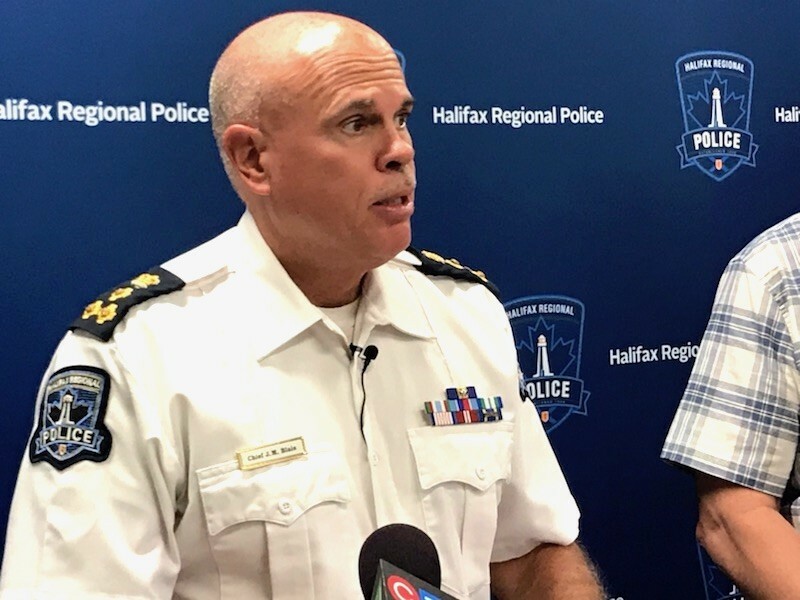 Halifax Regional Police have launched an internal investigation into four of their own employees over the mishandling of evidence. A release from HRP says the investigation comes in response to information that materials in HRP's Exhibit and Property department were improperly handled. Chief Jean-Michel Blais said an investigation was immediately initiated after the allegations were brought to police on Wednesday. While it conducts its investigation, the police department has restricted four civilian employees from the property section to administrative leave. The Property and Exhibit Section handles items seized or surrendered to police, along with items found by officers on patrol. Lost items are returned to their proper owners when identified. Seized or surrendered materials are kept for investigations and court purposes before being either returned or destroyed. Police say the materials in this incident were already scheduled for destruction and were not related to any drug investigations. It was only back in January that HRP closed its two-year internal investigation into the findings from a Drug Exhibit Audit that documented widespread problems in the department's evidence control system. Even after the extensive review, investigators were unable to locate thousands of drug and cash exhibits. Officially, it's believed those items—including 30 kilograms of cocaine, 5,400 opioid pills and $8,000 in cash—were improperly destroyed. Property and Exhibit storage is a different physical location and wouldn't handle illegal drugs or cash. The drug audit and subsequent correspondence about evidence control within HRP, however, highlighted several failures in the tracking and handling of evidence including employee training, a lack of complete paperwork and inadequate supervision that could allow for severe mishandling of exhibits. The investigation into drug exhibits came about after constable Gary Basso was accused in 2015 of stealing a chemical "cut," used to dilute drugs, from an evidence locker at police headquarters. The Crown stayed and withdrew those charges last winter after delays in prosecution. Basso is set to face trial later this month on separate charges for allegedly assaulting a homeless man. Since the drug audit came out in 2016, the police department has implemented all 34 of its recommendations for improving exhibit security and plans to conduct full inventories of all evidence lockers on an annual basis.